Hi folks I thought its about time to start blogging about the little experience I have in low level exploitation and analysis - so here goes. To start off on your windows exploitation journey you need to be able to get to grips with a tool and some tricks to get you look at your target the right way. In this post I cover somethings that may help a ton! 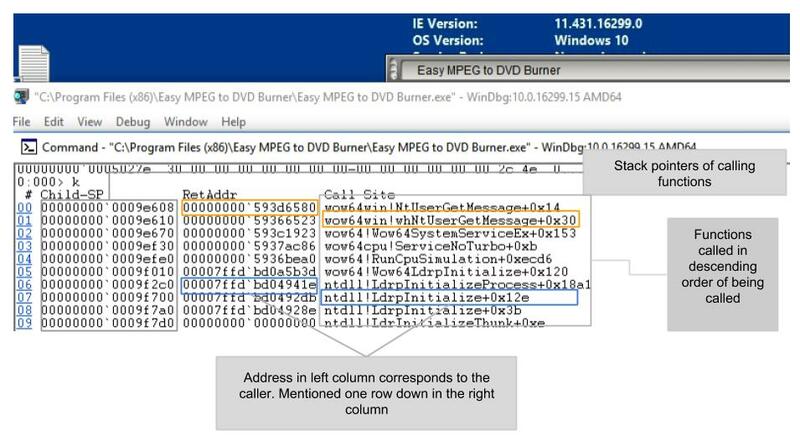 You should grab a copy of Easy MPEG to DVD Burner on exploit db. 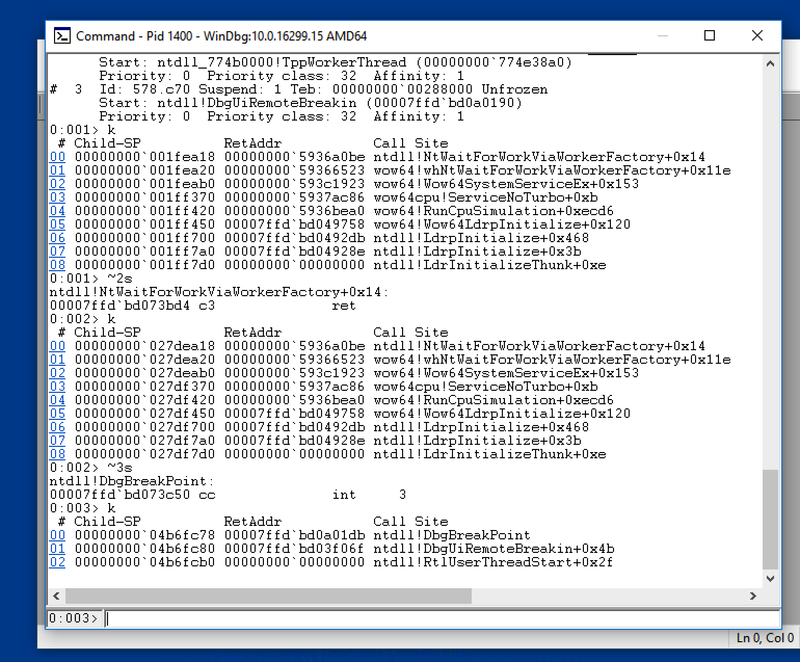 Once you've got your debugger hooked up; lets go over a few basic Windbg commands. When you're debugging something especially for exploit development purposes you're essentially trying to get memory to look a certain way most of the time - either loading up arguments for a function call you are crafting or tracking a certain variables values in memory. Before we can do any of that fancy stuff we need to get the debug target Easy MPEG to DVD to give the debugger a chance to get control of it - the way this is done is by issuing a break command or setting a break point essentially. Once you're connected go to the menu bar in Windbg and execute Debug -> Break. This shows a list of the threads that were in execution for the process we are debugging - it has 4 threads. A process could have 100s! The "." shows the thread we are currently with in context of, this means all the stack dumping and memory contents will happen with regards to the registers and memory configuration of this thread. It could be pretty annoying to change threads manually every-time you need to do this what if you wanted to fire off commands for each thread from a single thread context? You can do that by using the ~* command and then giving it something to do per thread as follows ~* k, or in the general sense you issue any combination of commands using the ~* [command string] format. Comes in very handy! What we are looking at is summary of the current call stack. Each line describes a given function that has some stack presence in the thread being analyzed. You will notice in the leftmost column a list of the "top of stack pointers" (ESP/RSP registers) for each function being called appears. Further to the right from that a list of the return addresses for each function, and lastly in the right most column the actual place where each function was executing when it called the function above it in the stack. You might not know how this data structure works or why it is so fundamental to all computer architectures, below I give a few hints about why it works a certain way. As much as intels engineers want to claim pioneering of these things they are doing nothing more than putting in practice principles of computer science that existed before computers even did. Here's a low down on stacks and how they work (in a broad view). Taking a look at the stack in the dumps above, something to note is how the stack "unwinds". The values in stack memory are there in order to operate a certain data structure, the "stack" is obviously named so because it is actually a stack in some sense a kin to that of one studied in computer science. Its just that here the stack is used to track which functions are currently executing. In general: Computers are defined on an endless process of recursion, each instruction you give a computer no matter how fundamental or atomic is actually in lower levels composed of a recursive composition of functions - whats more is the language you describe it in (if spoken by humans) is also defined on this kind of fundamental recursion (we notice this more obviously in structures like proto-language trees--why didn't the linguists use a simple list?--context free grammars, pushdown automata etc). Its a property of language to some extent and its what computation demands of our actuation of it today. When it comes to enumerating and keeping track of recursive operations a stack is as complex as you need to get. The function stack here is composed of each function being executed and the functions that called it, as well as any variables and memory contents local to its definition. The machine needs this structure in order to determine who's turn it is in which order. If you've ever played magic the gathering you will be very thankful things like stacks exist - especially if you're going up a person who is a rockstar with instant spells lol. Think about it for a second, if you want to impose strict rules on how to isolate a variable as existing within the execution of a given function only: The simplest way is to use a stack address for it and just halt hard every time its referenced outside its function context (here is where von Neumann and the Harvard machine take the lead in forming a design that can actuate the principles of computation coming to the fore in things like function stacks and memory address lists). But how do set it up so that you can address each functions memory according to its unique contents? This is partly achieved by using CPU registers with certain values to locate stuff on the stack (the rsp/esp - top of stack pointer and rbp/ebp - bottom of stack pointer are instrumental in this!). In a number of machine architectures today the mangling of CPU registers that handle stack addressing is achieved by the calling conventions as actuated by the compiler - the code compiler handles setting up the instructions for each function so that, when it begins executing or starts executing/calling another function; some code is automatically added to set up, and tear down all the stack niceness it needs. 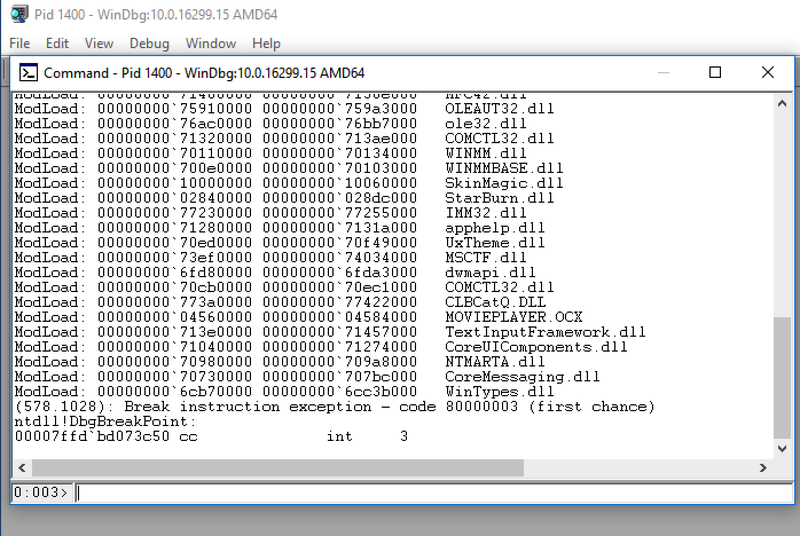 So lets look at how the stack is unwound in memory using Windbg. You might want some kind of proof that the addresses in the left most column actually do follow the order I describe. So lets find a way to unpack these values and show that they do relate to each other in this way. Here i do this by using the "?" command which decodes some values for us into decimal (makes it easier for us users to read). What was executing when the crash happened - (you can do this by looking at the stack, disassembling memory around the instruction pointer). If its a stack overflow - what does the stack looking because of the crash? Make sure you can whip out WINDBG and scry out some stack weirdness. You're gonna need it you want to write exploits! Local Scope - variables that can only live inside a local function scope. Global scope variables - are meant to be reference-able by every function in the thread. For the most part, references to their actual locations are stored in the stack if a function is dealing with them (this is also party because of the size of objects or arrays that programs process they tend to be pretty dynamic in size so its a bit silly to put them on a stack - heaps are waaay better place for them). Different architectures have more or less unique regions in a threads memory for each unique kind of global variable. Uninitialized variables - variables that hang around in a special area of memory until you actually fill them with contents. Static immutable variables - usually variables that hold values you don't want to change during execution of the program. Heap - Usually used a place to store variables requested during runtime with variable length. Lets check out some the stack contents being used by our function, first we need to dump the contents of the current functions stack, you do that by issuing the dc command and giving it the esp register (optionally you can add another address to specify where it must stop reading). The dc command displays memory in double word format, because many of the functions we are poking at here (for lack of a better example) are actually part of a 64 bit format library we are better off looking at memory the way it does, in nice neat 64 bit units. What if we want to look at some of things detailed in the stack summary? What about the arguments passed to each function on the stack how do we see them? (Often you will need to ensure you can trigger and craft certain execution in the machine once you've subverted control of the EIP, to confirm you are stuffing bytes into memory in the right way viewing the stack and see which arguments are being used is a quick way to confirm this). For now this mostly looks like nonsense, this is because sometimes the values pointed to are structures or linked lists that don't lend themselves to be understood so easily on base sight - you understand them by unpacking their relation to other contents in memory perhaps or how they are worked during runtime. We have been given a little mercy here by being able to easily identify what looks like some ascii strings in memory (there's a d* command for dump memory as strings btw). 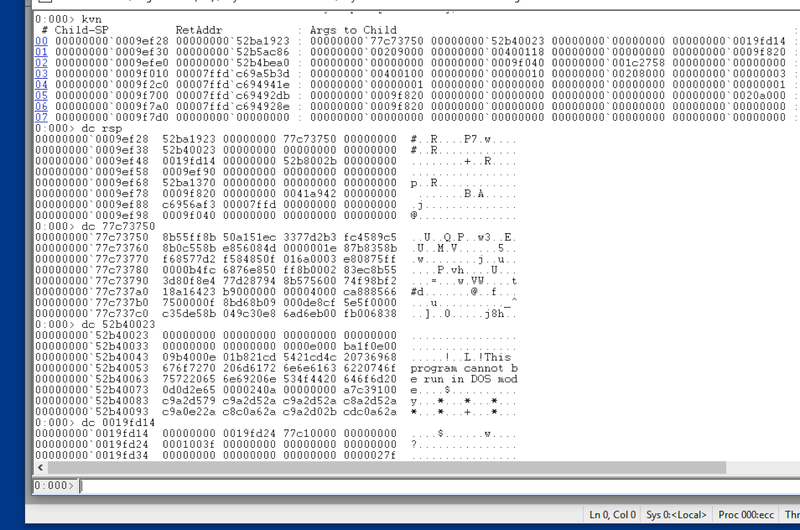 Obviously it goes without saying the strings shown here are pretty common byte patterns for windows executables. My guess is its probably environment variables but that will again require more fiddling! And so we've dumped the contents of the stack and shown how the stack summary unwinds. Pretty straight forward stuff! Thats it for this post folks look out for a follow up to this one soon!